Current Texas Judging Cup rankings based on the 71 contests held between 4/17/2019 and 4/17/2019. We combine the results for contests where two parellel events are taking place and they both judge the same classes such as multi-area events. Green shading indicates a team that has new results in the past four days. We COMBINE the results for 4H and FFA at San Antonio. Rankings used for the Texas Cup are what they would be at the contest if both groups competed with each other. Nothing at all required. Just enter your FFA team or 4-H club in contests in the state of Texas that are reported on Judgingcard.com. There's no sanctioning for events and no entry fee. Every contest reported on Judgingcard will be included in the ranking and every team that finishes in the top twenty at an event will earn points. 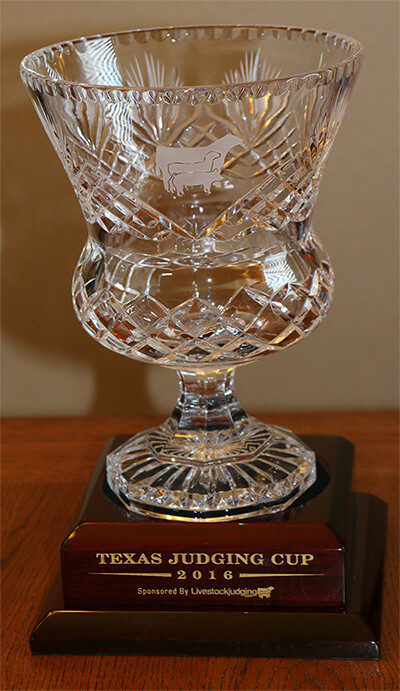 Points for the 2018 Texas Cup are earned between the Texas 4H Invitational in 2017 and the end of the Texas 4-H state judging contest in 2018. Points will be rounded to the nearest whole number. A 4-H club or FFA chapter can only earn points from one team at any individual event. If there are two teams from a club/chapter that earn points, only the points earned from the highest placing team will be considered. A team can earn points for up to ten events in a year. In the common occurrence of teams entering more than ten events, only the top ten events (by points) will count toward their overall score. The Texas FFA and 4-H state contests will each count for 1,000 points. 773 Long Meadow; Spring Branch, TX 78070 © 2018 Terms & Privacy.